San Francisco’s first cable car line opened in 1873. The successful development of the electric streetcar by Frank Sprague in 1888 plus the 1906 San Francisco earthquake resulted in the decline of the cable car system. Concerned that the cable car system would vanish, San Francisco resident Friedel Klussmann rallied public support to save the cars. The 1982 shutdown of the cable car lines for their rebuilding led to Trolley Festivals beginning in 1983 until 1987 using a variety of historic streetcars on Market Street. Those successful festivals resulted in rebuilding the streetcar track on Market Street and the establishment of the F streetcar line in 1995 using Presidents’ Conference Committee streetcars purchased from Philadelphia and refurbished in a variety of paint schemes that represented cities that once had streetcar service. 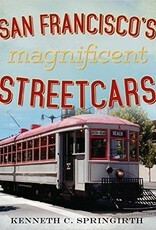 In addition, the line features vintage Peter Witt streetcars from Milan, Italy; a boat like streetcar from England; and other unique cars. During 2000, the F line was extended to Fisherman’s wharf and has become one of the most successful streetcar lines in the United States. 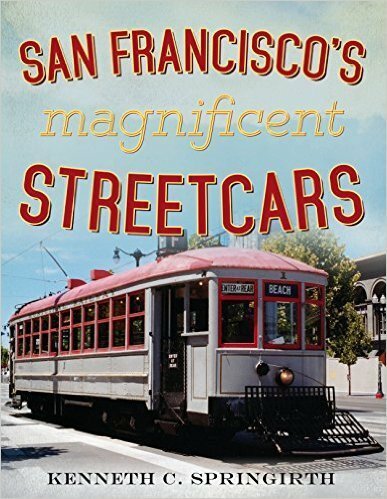 This book is a photographic essay of “San Francisco’s Magnificent Streetcars” along with its historic cable cars and hill climbing trolley coaches.